Every type of floral arrangement begins with applying good floral design basics, including solid mechanics, color grouping and focal lines. One of the problem areas I see with many DIY floral designers is their lack of knowledge and experience in these areas. That’s why I love this instructional video from Beth O’Reilly. If you really want to improve your design skills and increase your knowledge of floral design basics, then I have a feeling that you’re going to love this video, too! Take a look and see. I hope you got a lot out of that. 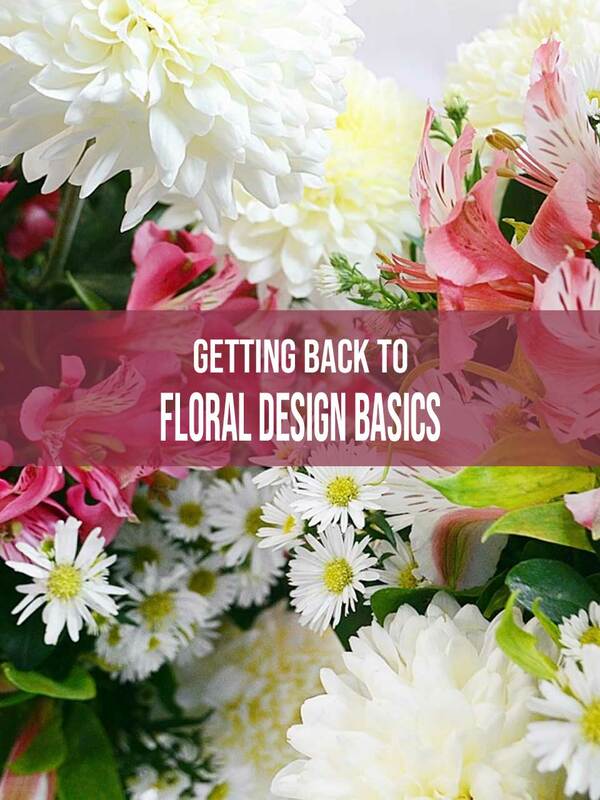 Armed with this basic knowledge coupled with some hands-on experience, you’ll be ready to take on any type of floral design project with confidence. And while we’re on the subject of floral design, the flowers and greens used in this bouquet, including the curly willow, monstera leaves, deflexus, calla lilies, anthurium foliage, lilies, magenta roses, anthurium, beehive ginger, and orange roses can readily be purchased online. You can find them all at sites like BloomsbytheBox, GlobalRose and FiftyFlowers. These three are the ones that I’ve had personal experience with. There are others that look great as well, like WholeBlossoms.com and BunchesDirect.com, but I have no experience in dealing with them. Of course, you can also order them from a local florist. The price may be a little more, but you can usually get smaller quantities. The flat reed used in the video can also be found on Amazon. Although commonly used in basket-making, it’s also an inexpensive accent for many types of floral designs. So look, right off the bat, an admission is in order. Truth be told, the main reason this site exists is a selfish one. I can’t seem to get enough when it comes to great tutorials (like the floral design basics video you just finished viewing), and I honestly just wanted a place where I could re-watch and share all of my favorites with you under one roof. But I’m also somewhat of an opportunist. I’m just being honest. I love sharing great content, and I also enjoy earning sponsorship revenues and affiliate commissions… hopefully, you don’t see anything wrong with that. It’s a wonderful world we’re living in where we can get paid for sharing our passions. I like to take full advantage. Even so… hitting you over the head with sales pitches is not why I’m here. So come on back! I will be sharing more and more incredible videos with you. They’ll cover subjects including weddings, plants, and flowers… and so on and so forth. And as a final note, your comments are very much appreciated. Using the comments section below, please tell us what you did or didn’t like about the video.